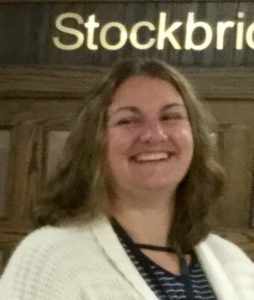 There is an unflappable quality to Meghan Kunzelman, Stockbridge Community Schools’ first female Athletic Director. 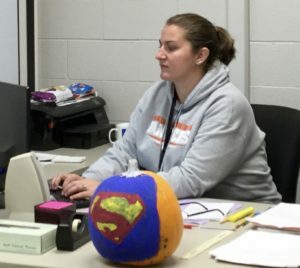 There is an unflappable quality to Stockbridge Community Schools’ first female Athletic Director. One might say Meghan Kunzelman emanates competence and good-natured steadiness, a Kunzelman Factor if you will. 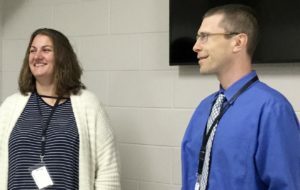 Senior High Principal Jeff Trapp may have hit the nail on the head when he said, “Meghan has had a positive impact right from the start as she puts her best into everything she is a part of.” And the list of everything Kunzelman is part of runs long. In addition to all things A.D., the tall brunette coaches Girls Varsity Volleyball, teaches a yearlong algebra support class, and is responsible for “Check In and Check Out,” a support program for middle school students. “If kids are having educational or behavioral issues,” she explained, “I check in and check out with those students to be sure the problem is not continued.” Plus, Kunzelman “helps with minor discipline.” In other words, she functions as assistant principal without the title. “I’m doing well.” Kunzelman grinned. “I just work a lot. I’m finding balance now.” She admitted she misses retired secretary Mary Carpenter, who used to coordinate the awards for the former A.D., Joe Wenzel. To profile Kunzelman solely according to her professional career, however, would be a disservice. Last June, she and husband Benn Kunzelman, a super-specialized millwright in blade technology, celebrated their 10-year wedding anniversary. Together, the couple is raising two boys, Hunter and Beau. In fact, a majority of the Benn’s family lives in the area. His father, Gordie and wife Penny Kunzelman, reside in Gregory; Benn’s mother and stepfather, Sarah Willson-Lennen and Scotch Lennen, live in Stockbridge; and his brother Matt and family live in Gregory. Beau and Hunter now relish going to school with three of their cousins. All told, Smith Elementary attends to five Kunzelman children: kindergartner Beau, three first graders including Hunter, plus a third grader. 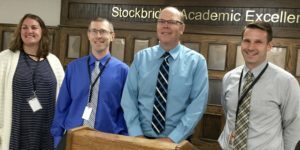 L to R: Athletic Director Meghan Kunzelman, Junior High Principal Joe Wenzel, Superintendent of Schools Karl Heidrich, High School Principal Jeff Trapp. Kunzelman stressed the importance of athletes keeping their grades up. Since the volleyball team’s G.P.A. was 3.5, she nominated them to Academic All State. She also nominated three seniors with 3.7 or greater grade point averages. The process required sending transcripts and completing paperwork, and on November 15, Kunzelman learned that her efforts had paid off. Her Varsity Volleyball team was named to Academic All State. “It’s something we encourage all our coaches to do,” she said. On November 15, Kunzelman learned that taking the time to nominate her team had paid off. The Girls Varsity Volleyball team was named to Academic All State. When Kunzelman became A.D. this fall, she called an all-coaches meeting. “I see them a lot,” she said. By way of example, she attended all the home football games and most of the soccer games. “I was at all the volleyball games, of course.” She grinned. Kunzelman met future husband Benn while attending Olivet College. She graduated with a degree in Physical Education and Health, minoring in math with a concentration in secondary education. For the past 11 years, she taught, coached and served as assistant athletic director in Stone Memorial High School in Crossville, Tennessee. Benn took a job with Atlantic Plant Maintenance where he works today, traveling to power plants and fixing their turbine blades to operate at maximum efficiency. Between teaching full time and giving birth to two sons, Kunzelman earned a Master of Science Degree in educational leadership and an administration license from Tennessee Tech. Acquiring her Michigan license required the completion of additional coursework in teaching reading. Always doing her best with a desire to help others, a commitment to family and education, a sense of teamwork and place, plus a ready laugh–maybe these attributes form the heart of that indefinable Kunzelman Factor. Tuesdays, March 6, April 3 & May 1 • 5–7 p.m.
For Saturday, March 10, 2018. A Chicken and Biscuit Supper will be served at the Plainfield United Methodist Church, 17845 M-36, Gregory, MI 48137, starting at 5 pm. Free will donation. Take-outs available. All welcome. Contact 517-851-8932. St. Joseph Mercy Chelsea and The National Alliance on Mental Illness of Washtenaw County will host a free family-to-family educational program for families, friends and caregivers of individuals diagnosed with a mental illness such as major depression, bipolar disorder, schizophrenia, schizoaffective disorder, panic disorder, obsessive-compulsive disorder and posttraumatic stress disorder. This course will teach the basics about serious brain disorders and treatments, help connect people to community resources and teach important skills and coping techniques for their difficult journey. The educational program consists of a series of 12 weekly classes structured to help parents, friends, and caregivers understand and support individuals with serious mental illness while maintaining their own well-being. Date: Thursday, March 15, 2018 for 12 weeks. Please call 734-680-5312 to register and to speak with Kathy Walz, Behavioral Health Navigator at St. Joseph Mercy Chelsea. St. Joseph Mercy Chelsea and The National Alliance on Mental Illness of Washtenaw County will host a free peer-to-peer educational program for families, friends and caregivers of individuals diagnosed with a mental illness such as major depression, bipolar disorder, schizophrenia, schizoaffective disorder, panic disorder, obsessive-compulsive disorder and posttraumatic stress disorder. The class will be led by trained peer mentors who also live with mental illness. This is not a support group, but a supportive, safe and confidential program. This course teaches the basics about serious brain disorders and treatments, helps connect people to others who share a similar experience and teaches important skills and coping techniques for their difficult journey. There is no cost for this class but registration is required. Please call Kathy Walz, Behavioral Health Navigator at 734-680-5312 to register. the Stockbridge Library, and CADL’s Stockbridge branch. Fridays, May 4–25 • 5:30–7 p.m.
John Robinson will be doing a signing for his new Rock ‘n’ Roll book at Cravingz Coffee Shop in downtown Stockbridge on Saturday, May 5th from 10 am to 1 pm. Hope you’ll stop by! Your’re invited to the Grand Opening of two new businesses in downtown Stockbridge on Saturday, May 5 from 10 am to 5 pm. They’re located at 104 E. Main Street. The Weathered Loft sells rustic, farmhouse, shabby chic and vintage inspired home decor and more! Phone: 989-331-0336. Angela Kolezar is the owner/pastry chef of Kneading Something Sweet. Phone: 313-530-8287. The Stockbridge Area Wellness Coalition and the 5 Healthy Towns Foundation are very proud and excited to host the BRIDGE TO WELLNESS CHALLENGE. The BTWC is a FREE 15-week weight loss and wellness challenge which kicked off on March 3rd and runs through June 15th. As part of the CHALLENGE we will be hosting a “Wellness Series” of six community events focused on “Moving More” and “Eating Better”. These events are not only OPEN to the CHALLENGE participants, but FREE AND OPEN to all community members. We welcome and encourage everyone to participate and take advantage of these educational and physical programs. Sunday May 6 on the square—Coffee & Donuts, mini swap meet and friends on motorcycles! Just like blood pressure screenings are helpful for physical health, screenings can be helpful for our mental health. Mental health screenings are offered at no cost by a licensed professional who will help develop an appropriate, individualized plan of support. This free program, presented by St. Joseph Mercy Health System, will be held on Wednesday, May 9 from 6-7 pm at the Stockbridge Jr/Sr High School. * What a vape is and how it is used. * What are the harmful effects of its use. * What are the legal issues surrounding vaping. For more information, visit SRSLY’s Blog. We want to be a blessing to the greater mid-Michigan community by opening the EchoCenter. Pastors, Youth Pastors and Youth Leaders are encouraged to attend the Pastors Conference on Thursday, May 10th. For information, to view the itinerary or to RSVP by Monday, May 7th, go to www.echo.love/events. The EchoCenter is a high adventure event center that offers zip lines and an outdoor team-building low ropes course. They also provide a spacious meeting area and commercial kitchen. The EchoCenter is a faith-based Christian non-profit organization located in Stockbridge, Michigan that provides a Christ-centered high adventure and team-building event center that inspires and challenges people to show God’s love to others through charitable giving and acts of service. Their mission is to encourage the community to help those in need, year-round. They do this by partnering with event guests to give back to a charity as part of the minimal fee to use the EchoCenter. The EchoCenter sits on 170+ acres of property and offers outdoor amenities like biking on maintained trails, a low ropes course with 11 elements and 5 zip lines and a repelling wall. We ask that you please RSVP to either event at www.echo.love/events by Monday, May 7th. Find us on Facebook, Twitter, Instagram and Pinterest @SelflessEcho. The General Public is invited to join our Miracle Meetings with Pastor Mark Hemans of New Zealand on Friday, May 11th and Saturday, May 12th. CHELSEA, Mich. (April 18, 2018) – St. Joseph Mercy Chelsea will sponsor the 29th annual Heart and Sole Run, Walk and Bike on Saturday, May 12 at Chelsea High School. Once again, all proceeds raised will benefit Behavioral Health Services at St. Joseph Mercy Chelsea. The race will offer several distance options for participants including a 10K, 5K and 2 mile run; a 5K and 2 mile walk; and a 13.8 mile bike. All races start and finish in the Chelsea High School parking lot, located just off of Trinkle Road. Online registration for the race is currently open at www.chelseaheartandsole.org. For all races, the registration fee for adults is $27 and $15 for youths (13 years and younger). A late fee will be accessed for adult registrations received after 11 p.m. on May 9. · 5K/10K Run/Walk 9:30 a.m.
· 2 Mile Run/Walk 9:40 a.m.
St. Joseph Mercy Chelsea offers a continuum of behavioral health services to meet the specific needs of patients and their families. These services include inpatient, outpatient, and day treatment programs. Coordination among these services allows patients to move from one level of care to another as their needs change. Patients and families are assured of personal, thoughtful care that addresses the physical, psychological and social aspects of well-being. Gee Farms and Stockbridge Area Garden Club are sponsoring a Lady’s Tea on Wednesday, May 16 at 2 to 3 P.M. It will take place at Gee Farms Nursery & Greenhouse located at 14928 Bunkerhill Rd., Stockbridge. The cost is $30 per person which includes a beverage, desserts by Laura O’Brien Sweets & Treats and a teacup succulent garden craft. If you would like to attend, please mail your payment by May 9th to SCN P.O. Box 83, Gregory, MI 48137. Make checks payable to Gee Farms. Participation is limited to 30, so be sure to register early. Proceeds will be donated to Stockbridge Community News. If you have questions, call 517-749-2679.
and for life. Thursdays, March 15, April 19 & May 17• 4–5 p.m.
Rummage Sale May 18-9am-5pm, May 19-9am-4pm at Millville UMC. Come rain or shine-all inside! All profits-Gals For Guatemala mission trip in 2019. 1932 N. M-52, which is 5 miles north of Stockbridge or 9 miles south of I-96 on M-52. For more info- 517-851-7853. There will be a Rummage Sale at Millville UMC on Friday, May 18th- 9am-5pm and Saturday, May 19th-9am-4pm in the fellowship hall for our Gals For Guatemala trip in 2019. Come rain or shine-all inside! Lots of bargains, but no pre-sales! Millville UMC is located at 1932 N. M-52, which is 5 miles north of Stockbridge or 9 miles south of I-96 on M-52. For more information contact the church at 517-851-7853. Set up begins at 9 am. Must register before the date. 24, April 21 & May 19 12–12:30 p.m.
May 19, will be presenting Bill Christen and the Interurban Railways. The public is welcome to join us at 2pm for his presentation, at the Waterloo Farm Museum, 13493 Waterloo-Munith Rd., Grass Lake, 49240. Here is a sample of his presentation. Bring your brown–bag lunch at noon and discuss books with us! 4th Fridays • 12–1 p.m.
Memorial Day Breakfast from 9-11am at Dansville Community Center, 1317 Mason Street. Free Will offering for your breakfast with proceeds to Gal’s for Guatemala Mission Trip. There will be lots of fun in Dansville on Memorial Day, May 28th and you won’t want to miss the annual Pancake Breakfast at the Dansville Community Center at 1317 Mason Street. We will be serving from 9-11am in the dining hall and breakfast will consist of pancakes, scrambled eggs, sausage, applesauce and a variety of beverages. A free will offering is asked for your breakfast and will go to the Gal’s For Guatemala Mission Trip in 2019.